ISTANBUL (AP) — Rising from humble origins to take the helm of Turkey’s government in 2003, Recep Tayyip Erdogan quickly attracted a fervent following. But Erdogan, who served as prime minister and then president, also became feared and hated by many who saw him as an increasingly autocratic leader seeking to erode the country’s secular traditions by imposing his conservative, religious views. On Sunday, voters decided whether to approve sweeping constitutional changes that will change the country’s system of government from parliamentary to presidential, and grant Erdogan even more authority. The changes, one of the most radical political reforms since the Turkish republic was established in 1923, could see the 63-year-old president remain in power until 2029. The amendments would give the president the power to appoint ministers and government officials, to name half the members of the country’s highest judicial body, to issue decrees and to declare states of emergency. Erdogan served three consecutive terms as prime minister as head of his Islamic-rooted Justice and Development Party, before becoming Turkey’s first directly elected president in 2014. Supporters found in him a man who gave a voice to the working- and middle-class religious Turks who long had felt marginalized by the country’s Western-leaning elite. He was seen to have ushered in a period of stability and economic prosperity, building roads, schools, hospitals and airports in previously neglected areas, transforming hitherto backwaters. But with each election win, Erdogan grew more powerful, and, his critics say, more authoritarian. 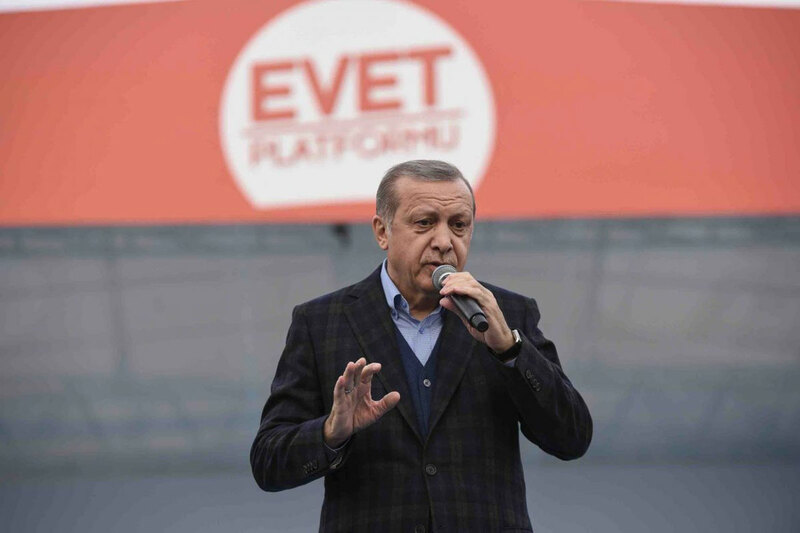 His election campaigns have been forceful and bitter, with Erdogan lashing out at his opponents, accusing them of endangering the country and even supporting terrorism. After surviving an attempted coup last July, Erdogan launched a wide-ranging crackdown on followers of his former ally, Islamic cleric Fethullah Gulen. Erdogan blames Gulen, who lives in the United States, and his supporters for plotting the coup, an allegation Gulen has denied. The crackdown saw roughly 100,000 people lose their jobs, including judges, lawyers, teachers, journalists, military officers and police. More than 40,000 people have been arrested and jailed, including pro-Kurdish lawmakers. Hundreds of non-governmental organizations and news outlets have been shut down, as have many businesses, from schools to fertility clinics. Erdogan has also blasted European countries, accusing authorities in the Netherlands and Germany of being Nazis for refusing to allow Turkish ministers to campaign for Sunday’s referendum among expatriate voters. His critics fear that if the “yes” vote prevails in the referendum, Erdogan will have cemented his grip on power within a system that has practically no room for checks and balances, opposition or dissent. “One person will determine national security policies, according to the constitutional changes. Why one person? What if he makes a mistake? What if he is deceived? What if he is bought?” said Kemal Kilicdaroglu, head of the main opposition Republican People’s Party, during a “no” rally in Ankara Saturday. As prime minister, Erdogan garnered support from Turkey’s Kurdish minority, which is estimated to make up about one-fifth of the country’s population of 80 million people. He eased restrictions on the right to be educated in Kurdish and to give children Kurdish names. He also oversaw a fragile cease-fire in the fight between the state and Kurdish rebels in the country’s southeast, a conflict that has claimed an estimated 40,000 lives since 1984. But the cease-fire collapsed in 2015, and about 2,000 people have died since then, including nearly 800 members of the security forces. With renewed fighting in the southeastern predominantly Kurdish areas, it is unclear whether Erdogan still would have much support from the Kurdish community. Erdogan has promised the new presidential system will herald a period of stability and prosperity for Turkey, a country that has suffered several coups in the past few decades.